Posted in Lama Zopa Rinpoche Bodhichitta Fund. Water bowls and extensive offerings at Ganden Do Ngag Shedrub Ling Center, Mongolia, offered by a dedicated group of elderly volunteers. 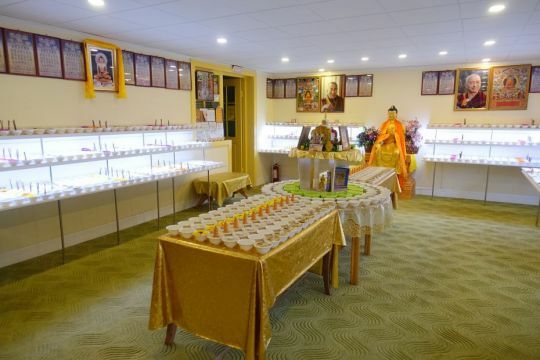 Since 2000, a group of very dedicated volunteers have been offering over a thousand water bowls plus extensive offerings of flowers, incense, candles, and food daily at Ganden Do Ngag Shedrub Ling Center, Mongolia. In August, Lama Zopa Rinpoche offered these volunteers lunch to thank them for their incredible kindness and perseverance. Most of the volunteers are retired women who have been providing this service every morning for a number of years. The average volunteer is 60-75 years old and there are two ladies who are 86. Despite hardships of weather (temperature lows can reach -20 °F) or physical challenges, the volunteers complete the offering practice daily. If 10-15 people participate, they finish in approximately 1.5-2 hours; if just a few participate, they need 2-3 hours to complete. At the conclusion of the daily offering activity, they all enjoy breakfast together. This is remarkable dedication on the part of these extraordinary volunteers. Volunteers enjoying lunch offered by Lama Zopa Rinpoche as thanks for their dedication. This is one of a few places in the world where extensive offerings like this are happening every day. The only other locations are at Kopan Monastery, Nepal, (in Lama Zopa Rinpoche’s rooms); Root Institute, India, (in Lama Zopa Rinpoche’s room); Kachoe Dechen Ling, CA, USA; and Buddha Amitabha Pure Land, Washington State, USA. 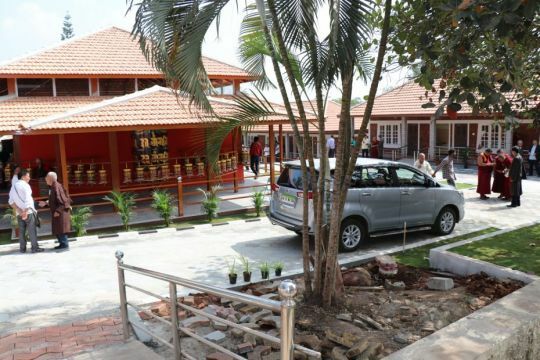 Extensive light offerings occur at Amitabha Buddhist Centre, Singapore; and Chokyi Gyaltsen Center, Penang, Malaysia. Please rejoice that these daily offerings are occurring in Mongolia and the other locations mentioned around the world. Lama Zopa Rinpoche often advises students, whenever making offerings ourselves, to visualize places around the world where extensive daily offerings are made, in order to greatly increase our own effort. In this way, all are welcome to participate. Lama Zopa Rinpoche personally makes these offerings daily in his prayers before meals. Thanks to each of the dedicated volunteers who have committed to offering in this way daily despite external complications or obstacles. Truly amazing! Posted in Retreats and Practices. Lama Zopa Rinpoche teaching at Amitabha Buddhist Centre, Singapore, March 2016 in front of Thousand-Arm Chenrezig statue. Photo by Ven. Losang Sherab. One of Lama Zopa Rinpoche’s Vast Visions for the FPMT organization is to sponsor 100 million mani retreats (100,000 recitations of 100 million OM MANI PADME HUM) around the world. We invite you to rejoice that 29 of these retreats have been completed so far according to Rinpoche’s wishes. Only 99,971 to go! You can read details of the completed retreats on our newly designed 100 Million Mani Retreats page. The next 100 million mani retreat is scheduled for October 7-20, 2019 in Kalmykia, Russia with Lama Zopa Rinpoche and Geshe Tenzin Zopa serving as the retreat leader. Please email Ganden Tendar Ling for more information about the retreat. The Practice and Retreat Fund provides grants and sponsorships for students engaged in retreats such as 108 nyung nä retreats, 100 million mani retreats, recitations of sutras and long term retreat. Large Guru Rinpoche thangka displayed at Khachoe Ghakyil Ling every year. 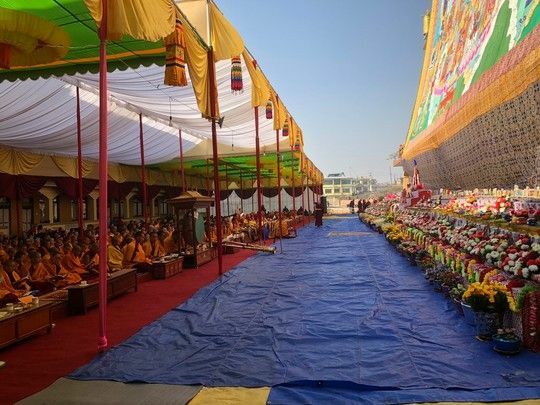 For the forth year a very large thangka of Guru Rinpoche (Padmasambhava) was displayed and an auspicious 100,000 tsog offering event (Guru bumtsog) took place at Khachoe Ghakyil Ling, Nepal, also known as Kopan Nunnery. 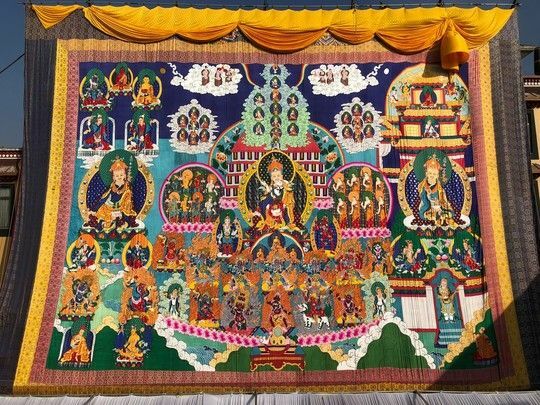 The thangka, which is 75 feet (23 meters) high and 87 feet (27 meters) wide depicts in stitched appliqué the Padmasambhava merit field in the center. The incredible weight of the thangka and raising it safely up large scaffolding to display requires tremendous skill and effort. All Sangha present (approximately 1,000) received offerings for their participation. The Holy Objects Fund sponsors this ceremony, the cost in 2018 was US$11,850. Tremendous thanks for the kindness of Khachoe Ghakyil Ling for hosting this incredible event and catering lunch for all involved. The entire set up for this requires a solid week to execute. Sangha participating in Guru bumtsog at Khachoe Ghakyil Ling during the display of the giant Guru Rinpoche thangka. Please rejoice in this annual event which is fulfilling Lama Zopa Rinpoche’s Vast Visions and has profound effects on clearing obstacles of all types in Nepal and the world. The Holy Objects Fund offers grants to the creation of holy objects around the world. All are welcome to donate to this fund to ensure grants like this continue long into the future. Posted in Supporting our Lamas. Long life puja offered to Lama Zopa Rinpoche at Kopan Monastery, December 17, 2018. Photo by Ven. Lobsang Sherab. Every year, Ven. 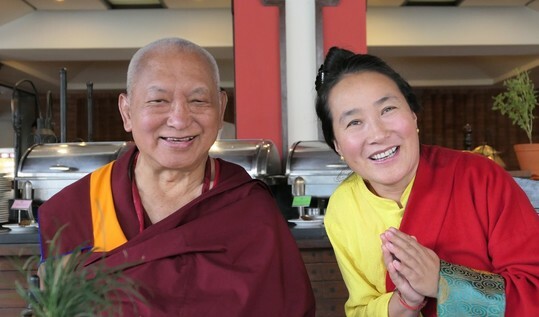 Roger Kunsang, assistant to Lama Zopa Rinpoche and the CEO of FPMT, Inc., checks whether any practices need to be done to contribute to Lama Zopa Rinpoche’s health and long life. This year, Khadro-la (Rangjung Neljorma Khandro Namsel Dronme) advised that a 16 Arhat Long Life Puja, with additional recitations of Tenden Dukpa, would be beneficial. This long life puja will be offered at Kopan Monastery on April 6. Khen Rinpoche Geshe Chonyi is flying in from Singapore to preside over the ceremony. All are welcome to participate in this puja by offering any amount toward the costs, or doing prayers during the day while this is happening. Additionally, you may download one of Lama Zopa Rinpoche’s long life prayers to use at any time. The official long life puja offered every year on behalf of the FPMT organization and students will take place at Kopan Monastery on December 7. The Long Life Puja Fund contributes to long life pujas offered to Lama Zopa Rinpoche. 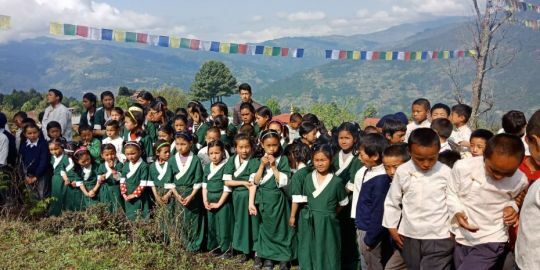 You can also learn about the many Charitable Projects of FPMT and discover the many ways the various funds and projects are benefiting others..
Students of Sagarmatha Secondary School. Since 2015, the Social Services Fund has been offering support to Sagarmatha Secondary School in Chailsa, Nepal. 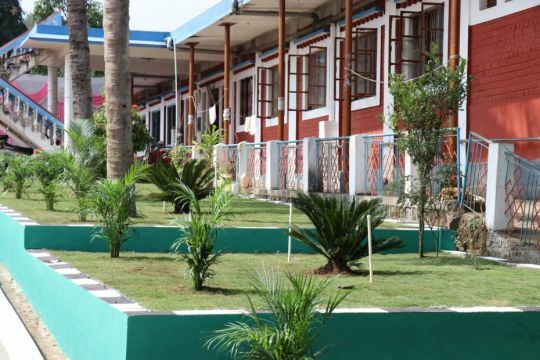 The school stands on what was once a Tibetan refugee camp. 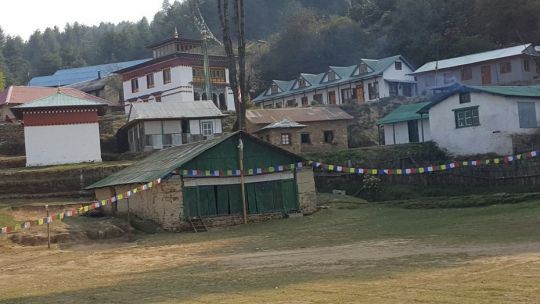 It currently serves 170 students, including 79 young lay students who live at the school hostel and 25 young monks who live at Thubten Shedrup Ling Monastery, which shares the school grounds. Eleven teachers and one additional employee support these students. Recently, a US$28,000 grant was issued to the school for the 2018 academic year. This was only possible due to the kindness of people supporting the Social Services Fund. Thank you for making this possible. 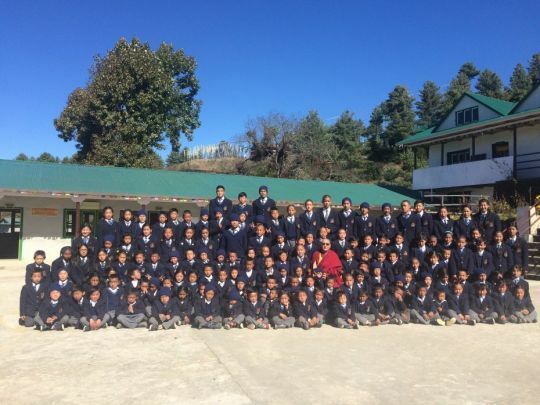 Khen Rinpoche Geshe Thubten Chonyi with the students of Sagarmatha Secondary School. This grant covers the salaries of teachers in addition to yearly text books and one set of school uniforms per year for the students. Grants are also offered for prize distribution for exams, sports competitions, as well as other extra curricular activities. Last year, Lama Zopa Rinpoche sponsored the school uniforms plus shoes and warm socks. The students of this school are ethnically Tibetan or Sherpa, and some come from meager means. The school tries to help in any way, such as finding outside support for the children’s additional clothing needs. An educator with students of the Sagarmatha Secondary School. Sagarmatha Lower Secondary School is a government-registered school which means it is recognized by the Nepalese government and can participate in nationwide exit exams. The school has to expand to best support students. Without expanding, the children will have to go to boarding school in Kathmandu to finish their educations. This is prohibitively expensive for many local families and they would simply have to drop out once their education at the school finishes. Kopan Monastery manages the school as well as the hostel. Students of Sagarmatha Secondary School having a meal. We invite all of you to rejoice in the ongoing support offered from the Social Services Fund to schools such as Sagarmatha Secondary School. Sagarmatha Secondary School and hostel. 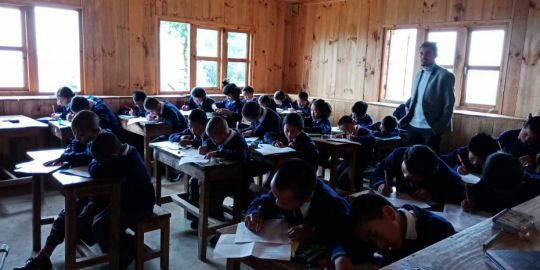 In 2018, the FPMT Social Services Fund offers over US$104,000 to six schools providing education to children of Tibetan, Nepali, Sherpa, and Indian heritage. This is made possible by all those who contribute to the Social Services Fund. If you would like to support the Social Services Fund and help ensure grants such as this can continue, you can read more about the charitable projects this fund supports, or donate any amount to the fund itself. The monks of Gaden Tharpa Choling Monastery in front of the new Nyung Nä temple. 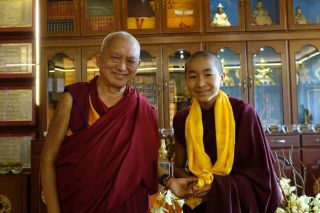 Lama Zopa Rinpoche with the reincarnation of Domo Geshe Rinpoche at Sera Je Monastery, Bulakyppe, India, December 2015. Photo by Ven. Roger Kunsang. Gaden Tharpa Choling Monastery in Kalimpong, India, was founded by the First Domo Geshe Rinpoche in 1912 while traveling on pilgrimage. Lama Zopa Rinpoche established a connection with the Domo Geshe Rinpoche lineage when he took ordination at Domo Drugkar Gompa in Tibet, also established by the First Domo Geshe Rinpoche. 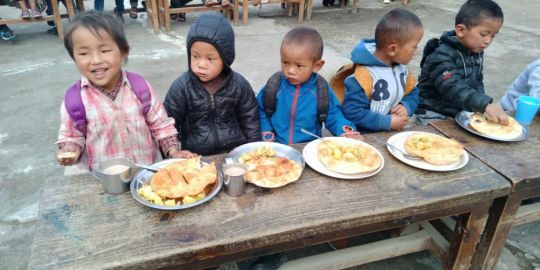 Since 2015, Lama Zopa Rinpoche has also been supporting the current reincarnation of Domo Geshe Rinpoche by sponsoring food offered to him daily, as well as the salaries for some of his teachers. In a letter of thanks to Tharpa Choeling Monastery in 2010, Lama Zopa Rinpoche further explains the connection. The new temple during construction. 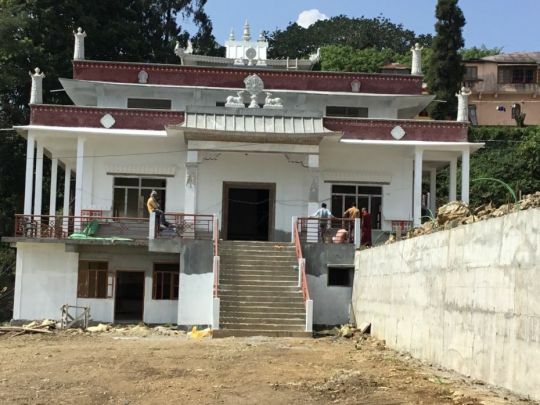 Due to the kindness of a benefactor, the Supporting Ordained Sangha Fund was pleased to offer a US$25,000 grant toward the building of a Nyung Nä temple at the monastery. About this retreat practice Rinpoche commented, “Nyung näs take such a short time, but bring strong purification. So many eons can be purified in this life; it makes it so easy to have attainments.” Nyung nä practice is an intensive two-day purification retreat that includes fasting, precepts, prostrations, prayers, mantra recitation, and offerings. Nyung nä is a practice based on the deity, Thousand-Arm Chenrezig, the Buddha of Compassion, and is extremely powerful for healing illness, purifying negative karma, and opening the heart to compassion. We are happy to report that this temple has now been completed. Please rejoice that this is now finished and will facilitate many powerful and beneficial retreats long into the future. If you want to help Sangha, please learn more about the Supporting Ordained Sangha Fund and the ways it supports monasteries and nunneries around the world. Posted in Puja Fund News. 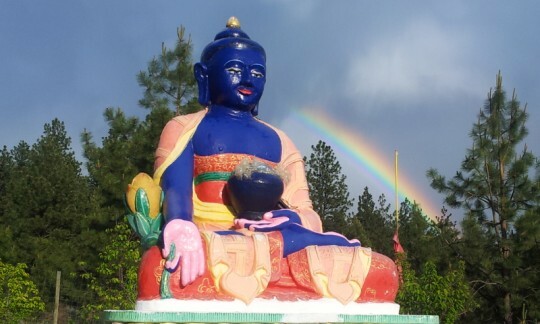 Medicine Buddha statue at Buddha Amitabha Pure Land, Washington. Monks offering extensive Medicine Buddha puja. Every month on the Tibetan 8th day the Puja Fund sponsors all the monks of Sera Mey Monastery to offer the extensive Medicine Buddha puja composed by the Fifth Dalai Lama dedicated FPMT centers, projects, services; all students who are ill or having life obstacles; benefactors of the Puja Fund, and to all beings. The Puja Fund offers a small money offering, tea, and bread to each of the approximately 2,000 monks performing the puja as well as the cost of light offerings and torma offerings. The Medicine Buddha encompasses all the buddhas. This means that when we practice the seven-limb prayer and make offerings with the seven limbs, we receive the same merit as we would if we had made offerings to all the buddhas. Similarly, when we recite the mantra of Medicine Buddha, we collect unbelievable merit just as when we offer the seven-limb practice to Medicine Buddha. To recite the Medicine Buddha mantra brings inconceivable merit. Manjushri requested the eight tathagatas (Guru Shakyamuni Buddha and the seven Medicine Buddhas) to reveal a special mantra that would make the prayers they (the eight tathagatas) made in the past (prayers to be able to actualize the happiness of sentient beings by attaining the path to enlightenment and pacifying various problems, to be able to see all the buddhas, and for all wishes to be quickly realized) to quickly come to pass, especially for those sentient beings born in the time of the five degenerations who have small merit and who are possessed and overwhelmed by various diseases and spirit harms. Please rejoice in this monthly offering that brings so much benefit to the entire FPMT organization. Every Tibetan 8th day, please remember that this puja is happening and you can mentally join in. This is something amazing to rejoice in, to mentally offer and dedicate toward, and also something you can contribute to by donating any amount. 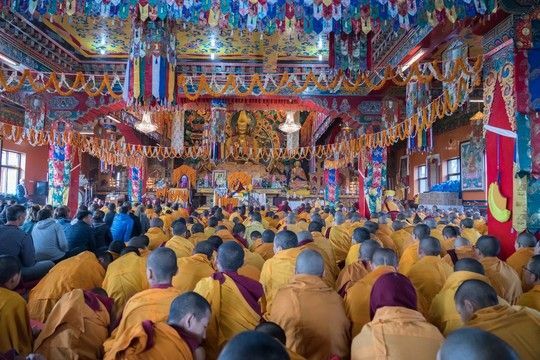 You can learn more about the beneficial prayers, practices, and pujas sponsored by the Puja Fund, or about FPMT’s other extensive charitable activity. 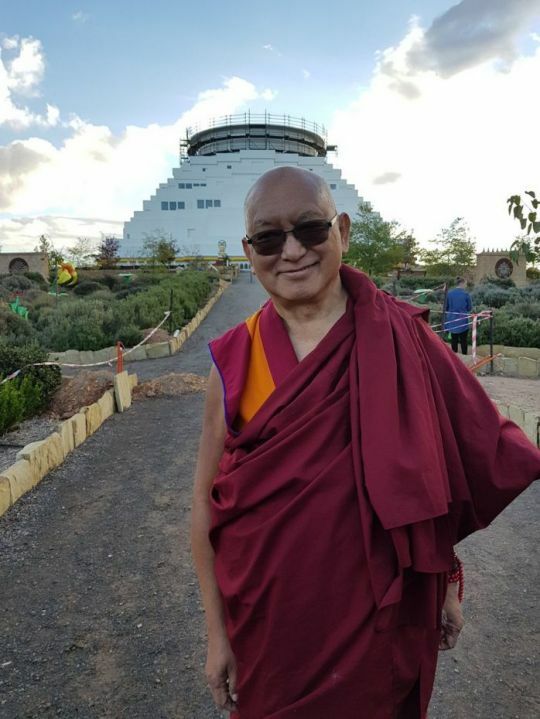 Lama Zopa Rinpoche outside of The Great Stupa visiting the Peace Park, Bendigo, Australia, May 2018. Photo courtesy of Ian Green’s Twitter page. 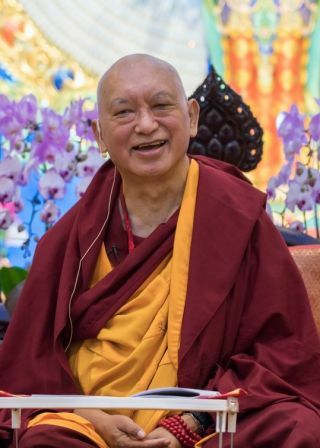 In May of 2018, Lama Zopa Rinpoche spent six-weeks teaching on Bodhicaryavatara (A Guide to the Bodhisattva’s Way of Life) and offering Rinjung Gyatsa Retreat at the Great Stupa of Universal Compassion in Bendigo, Australia. 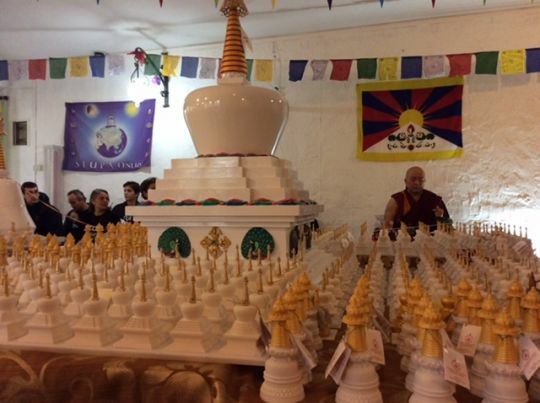 At the conclusion of this teaching event Lama Zopa Rinpoche offered US$30,000 to the FPMT entities in the area in support of their work: The Great Stupa of Universal Compassion, Machig Labdron Nunnery (a new nunnery at Atisha Center), Thubten Shedrup Ling, and Atisha Center. Rinpoche also offered the incredibly beautiful White Tara statue, which had been offered offered to him during the long life puja, to the new nunnery. The retreat was attended by a cross section of FPMT students, traveling from near and far, including more than sixty-five ordained Sangha. Please rejoice in Rinpoche’s kindness in offering these teachings and investing in the precious Dharma activity of the area. Lama Rinpoche gave an unprecedented number of teachings during this Australia retreat, all of which were streamed live online and are now available to watch as streaming video. You can learn more about the many beneficial activities of the Lama Zopa Rinpoche Bodhichitta Fund or other Charitable Projects of FPMT. Beautiful wall of eight stupas at Centro Muni Gyana, Italy. 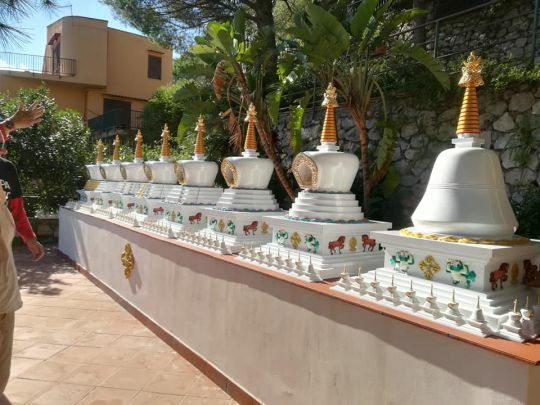 We invite you to rejoice that eight new stupas have entered the FPMT mandala at Centro Muni Gyana, Palermo, Italy. The Holy Objects Fund was pleased to offer a grant to sponsor the creation of these stupas which will benefit all who come in contact with them, as well as the entire area. Please enjoy these photos of the new stupas with tremendous thanks to Stupa Onlus for making these stupas and arranging their arrival. Geshe-la blessing stupas made by Stupa Onlus. 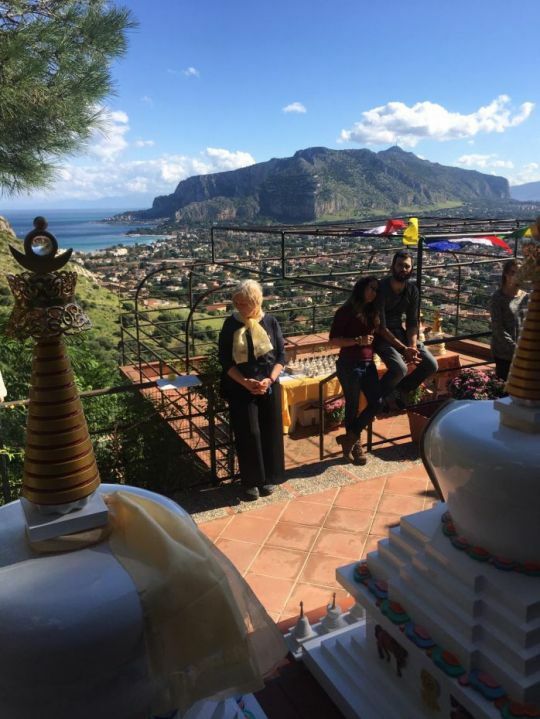 View of Palermo, from the side of the stupas. Arrival of the stupas to to Centro Muni Gyana. 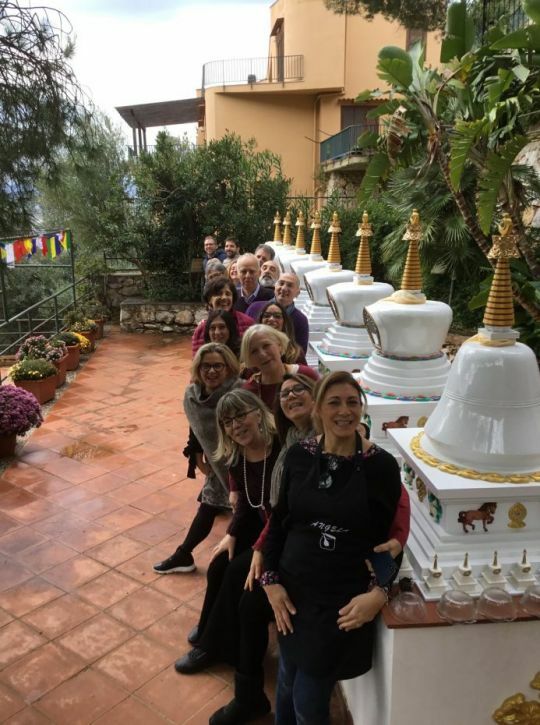 Recent FPMT regional meeting participants with the stupas. 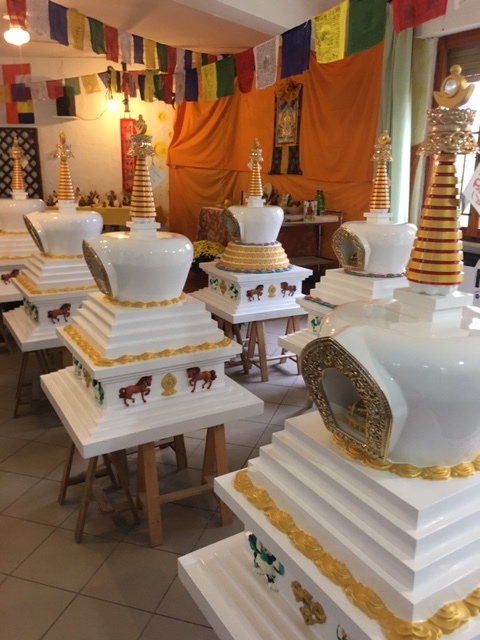 If you would like to contribute to the building of holy objects around the world, you are welcome to offer any amount to the Holy Objects Fund which contributes to the creation of stupas, prayer wheels and statues. 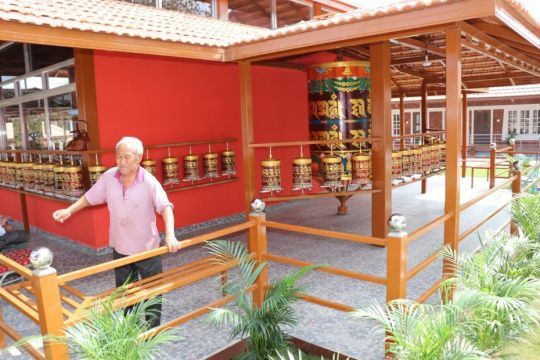 Completed buildings and prayer wheels at Lugsum Elderly Home. Over two years, the Social Services Fund offered grants to support the building of ten new rooms for accommodation (we provided sponsorship for five of these rooms) and the construction of large and smaller prayer wheels on the property of Lugsum Samduling Home for the Aged and Disabled, an elderly home in Bylakuppe, India, which cares for approximately forty elderly Tibetan individuals. Without homes and accommodation like this, many elderly first-wave Tibetan refugees have very little prospect of accommodation or support as many are without families of their own. Further, by supporting the creation of holy objects, FPMT is helping to take ultimate care of the elders by providing the conditions for them to create merit for this and future lives, not simply their immediate needs for survival. We invite you to rejoice in the completion of both of these projects, which were finished with high quality design and materials, for the benefit of this important community. 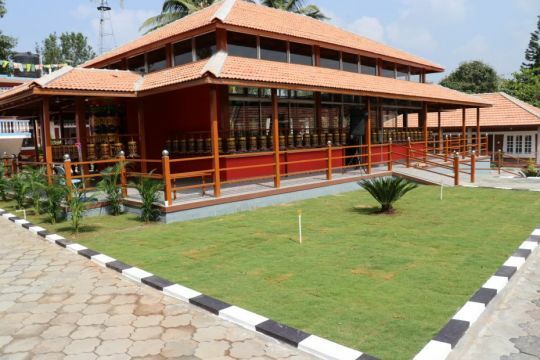 New prayer wheels and upgrade to the grounds of Lugsum Elderly Home. 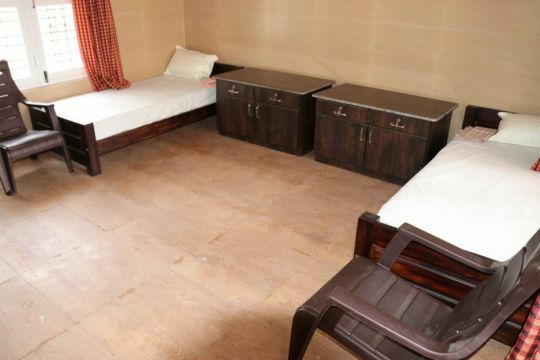 Two residents share these new simple, clean, and safe rooms at Lugsum Samduling Home for the Aged and Disabled. New rooms at Lugsum Elderly Home. 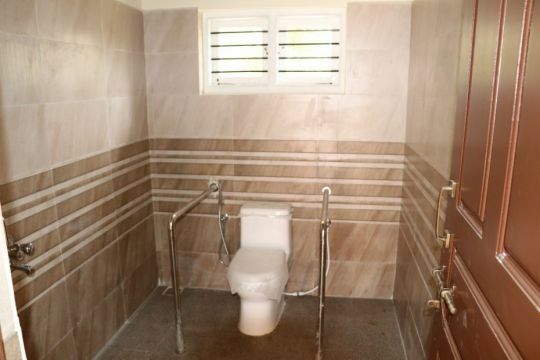 Safe and accessible bathroom accommodation for the elderly. Prayer wheels on the property which can be used by the elders in the community. FPMT Charitable Projects is honored to support the homes of the eldest and destitute Tibetan refugees. You can show your support by making a donation to the Social Services Fund. 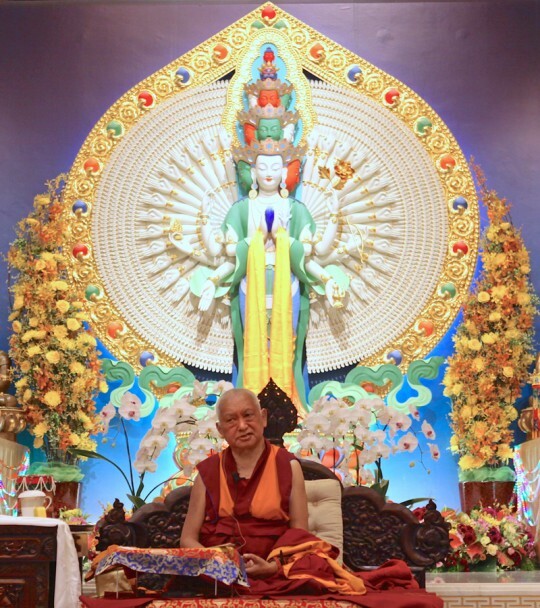 Lama Zopa Rinpoche teaching at Amitabha Buddhist Centre, Singapore, September, 2018. Photo by Lobsang Sherab. Recently Lama Zopa Rinpoche shared a heartfelt thank you to everyone who supported the Sera Je Food Fund for twenty-seven years of operation. 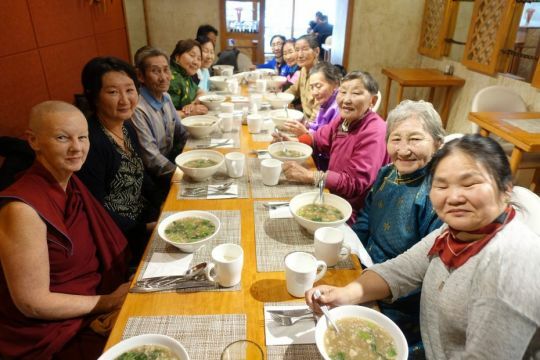 The food fund provided free meals to all of the monks of Sera Je Monastery for nearly three decades before handing over an endowment to the monastery which allows this offering to continue long into the future. Thank you very, very, very much! Thank you very, very much! So much merit you created, so many lifetimes to enjoy, to meet Dharma, to achieve enlightenment, not only to be free from samsara, but to achieve enlightenment. Free the numberless sentient beings from the oceans of samsaric suffering by you, and bring to enlightenment. So, thank you very much. You have to recognize the good karma, how much unbelievable good karma you collected. So many years, so many years, so many years, wow! You have to rejoice, rejoice! No time for depression, no space for depression in the life! Can’t imagine! For so many years, you have offered dinner, lunch, breakfast, can’t imagine, wow! Now, in many countries in the world, so many people are receiving lamrim teachings, philosophy teachings. Those people who offered food, they developed their education, they got their education and so many people in the world are receiving benefit from them. This is not material benefit but this is benefit for the mind! All those Sera Je monks, they are His Holiness’s disciples also. So, you are making offerings to the pores of your guru. In that case, every day, every breakfast, every lunch, every dinner, even if it was just one time, the merit you collect by making offering to one disciple of the same guru, His Holiness, you collect FAARRRRRRRRR more merits than offering to numberless Buddhas, numberless Dharma, numberless Sangha, numberless statues, numberless stupas, numberless scriptures. They become so small compared to offering to one pore of the guru, a disciple. On behalf of all who have been involved in the Sera Food Fund for the last twenty-seven years we would like to join Rinpoche—who made this project possible due to his incredible courage, kindness, and compassion—in thanking everyone from our heart. Thank you for your kind support, time, effort, and service over so many years. Many people came together to make this possible. You can watch this entire message from Rinpoche on YouTube. An edited transcript of this message is also available via PDF. Please also enjoy this recent in-depth look at the accomplishments and historical context of the Sera Je Fund over the last twenty-seven years. All are welcome to view this article in eZine or PDF format. You can read more about the history and impact of the Sera Je Food Fund. Posted in Ordained Sangha, . Karnataka, India. Photo courtesy of FPMT Charitable Projects. 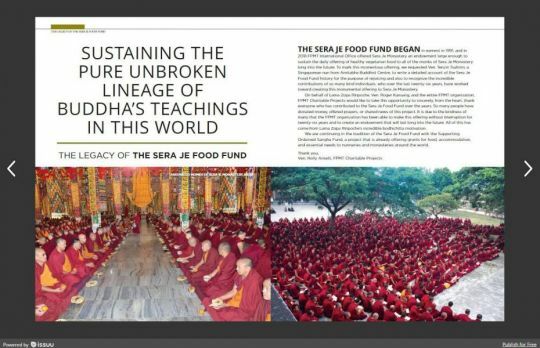 The latest issue of Mandala magazine features an extensive article, “Sustaining the Pure Unbroken Lineage of Buddha’s Teachings in This World: The Legacy of the Sera Je Food Fund,” which is an in-depth look at the accomplishments and historical context of the Sera Je Fund over the last twenty-seven years. All are welcome to enjoy this article in eZine or PDF format. is a massive achievement. In total US$5.3 million was granted to Sera Je Monastery for this endowment. We invite you to rejoice in Sera Je Food Fund’s incredible history by enjoying this article which chronicles its milestones and significance, both in practical terms with respect to the day-to-day operations of the project, and also in terms of the personal impact the food fund has had on its beneficiaries, the monks of Sera Je. We also offer this article as a heart-felt THANK YOU to all who have contributed to, worked on behalf of, shared news about, or supported in any way this project over the years. What you have made possible is truly amazing. I encourage people not to express their anger, not to let it out. Instead, I have people try to understand why they get angry, what causes it and how it arises. When you realize these things, instead of manifesting externally, your anger digests itself. In the West, some people believe that you get rid of your anger by expressing it, that you finish it by letting it out. Actually, in this case what happens is that you leave an imprint in your mind to get angry again.